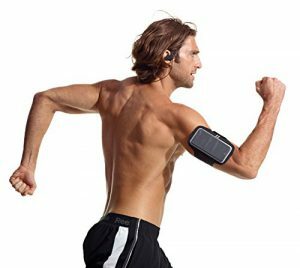 If you’re looking for the best wireless earbuds for running for 2017 then you came to the right place 🙂 Exercises like running can become a pleasurable activity when you have the option of spicing it up with some music. But using earphones while running has its own disadvantages. Ripping off cables of wired earphones or ruining the ear cups with sweat and water are not infrequent things in daily life. What you need, therefore, is a pair of earbuds which are wireless, waterproof, and check all the primary boxes for running headphones. 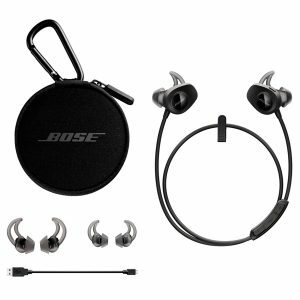 When it comes to Bose earphones, you can blindly trust the sound quality. The SoundSport wireless model lives up to its brand name, and delivers exceptional sound in a workout-friendly manner. The fact that the ear buds do not go completely into your ear canals means you are not sealed off from your environment while you are running through a busy street. Although the price is on the higher side, its durability and sweat resistant properties, along with the great sound, make it worth the bucks. Unless you are not willing to spend too much, this is the pair you must go for. The X3 wireless earphones by Jaybird are a direct improvement from the X2, but without significant changes. The thing with Jaybird is that their headphones do not peak the charts in any single aspect. Instead, they score reasonably well in all of them. The earbuds are small and come with silicone ear fins for secure fit. The sweat-proof nano-coating keeps moisture away, thereby ensuring hassle-free usage during running in the rain. 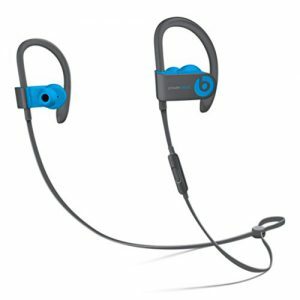 The Plantronics Backbeat Fit Bluetooth headphones are a perfect combination of quality and value for money. These are flexible enough so that they fit snugly inside your ear canal and do not fall off while running. Moreover, the eartip design is such that you are aware of the external environment during running outdoors. The on-ear controls give you complete authority over the functionalities. The headphones are IP57 rated with regards to waterproofing standards. The impressive 8-hour long battery life makes this product a great buy. 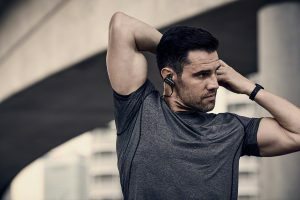 Designed only for workout sessions and sports activities, the Jabra Sport Pulse is one of the best wireless headphones currently available in the market. The sound is balanced, and the Sport Life app offers EQ settings if you prefer to dial in your sound. The built-in heart rate monitor is yet another lucrative feature in this product. With an IP55 rating, these earphones are able to withstand dust, sweat and rain. The only cons are the short battery life of 4.5 hours and the slightly higher price range. These are great wireless alternatives to the costlier earphones discussed previously. 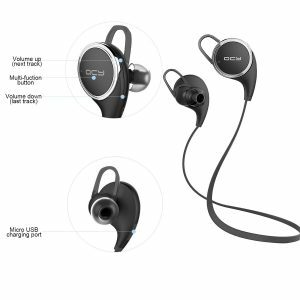 The ergonomic design of this Mpow product prevents the earbuds from falling off during exercise and training sessions. The headphones offer decent sound quality along with noise cancellation; so you can have a great hands-free phone conversation. The Bluetooth 4.1 technology has a range of 32 feet, and offers extended compatibility. The build quality isn’t amazing, but that’s understandable considering the price. 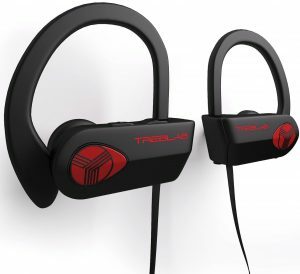 These headphones come with Bluetooth 4.1 technology that allows you to connect to a host of compatible devices, and deliver uninterrupted, clear stereo sound. You can change the track, adjust the volume, and control other functions with the on-board control buttons. The earphones are lightweight, sweatproof, and come with a 80mAh rechargeable battery offering up to 6 hours of playtime. The durability is questionable since many users have complained about the poor build on Amazon. Even then, this product remains one of the top picks in the wireless earbuds category under $25. If you are looking for true wireless earbuds with heart-rate sensors along with a variety of other features under $250, these are the pair of headphones you must be looking for. 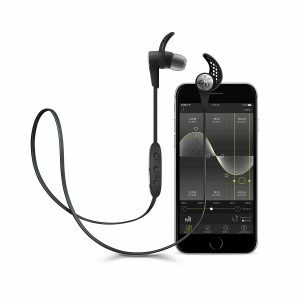 The Jabra Elite Sport is quite similar to the very popular Jabra Sport Pulse model, except that this one packs a few more features. The bass enriched sound with dual microphone technology ensures you have top quality earphone experience. It is IP 67 waterproof rated, and can handle lots of sweat. In fact, it comes with a 3 year warranty against sweat. The earbuds offer secure fit, and being true wireless in nature, allow you wear one or both of them at a time. The battery life is up to 3 hours which can be extended by another 6, courtesy of the charging case that comes along with the product. Designed to ensure the best possible fit and a sweatproof experience, the Photive PH-BTE70 are one of the most popular running headphones available in the market. Nobody likes to constantly readjust their headphones while on the move, and this product takes care of that effectively with its uniquely designed ear hooks. The sound quality is reasonably good, and the Bluetooth 4.0 technology offers uninterrupted music. 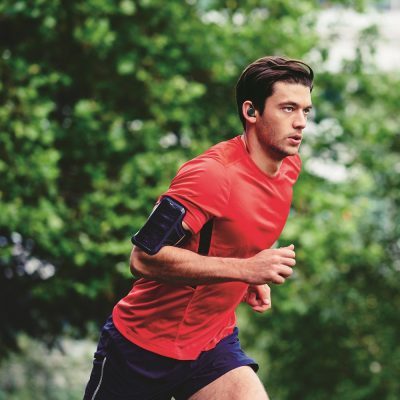 The on-board controls on the earbuds are easy to use and convenient while running. You can stop worrying about battery life since this one lasts up to 6 hours and charges quickly. 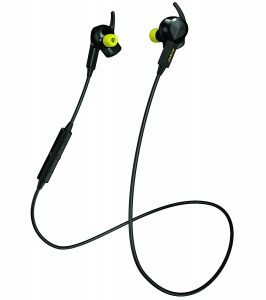 This is not the best in business, but when it comes to running earphones, the Powerbeats3 wireless model is worth looking into. The most important feature here is the over-the-ear hooks that keep those earbuds in place while you are running. The built-in mic and control module makes answering phone calls, changing tracks and adjusting volume levels easier. Some customers find the cable to be a bit long, but that should not be a deal-breaker. The product is sweat resistant and has rechargeable batteries with 12 hours of playtime. These earbuds pack in a lot of features within a small budget. Not only do they offer a sweat-proof experience, but are also able to resist water damage even when it’s raining heavily. The soft rubber ear hooks maintain snug fit, ensuring that the earbuds do not fall off during heavy training. The sound quality is reasonably good with solid bass and crisp treble. The microphones come with voice-activated prompts, thereby making your hands-free experience even easier. The Bluetooth pairing is quick, seamless, and reliable. The 9-hour long battery life, along with the other features, makes this product one of the best budget options in this category. The Phaiser BHS-530 is a fantastic pair of wireless earbuds, especially when you come to think of the price, you simply cannot hope for better. The ergonomic design optimizes comfort and secure fit while also maintaining a chic sense of style. 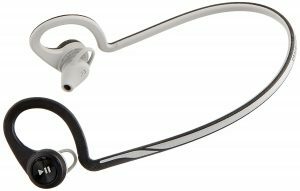 The behind-the-head design ensures the earbuds fit snugly and don’t fall off while you are running or working out. The 10mm speakers with Bluetooth 4.1 connectivity offer clear, crisp sound. The built-in microphone allows you to take calls hands-free. Further, it informs you about the caller’s number when a call comes in so that you don’t have to check your phone. 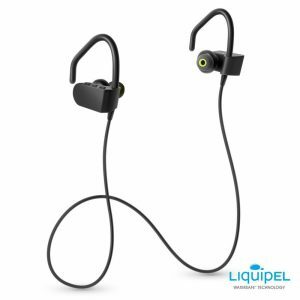 The headphones come with a lifetime sweatproof guarantee, thanks to its waterproof design that can easily withstand sweaty exercise sessions. If you want a sports headphone that doesn’t dig much in your pocket, yet offers a balanced sound quality with reasonable noise isolation, look no further. 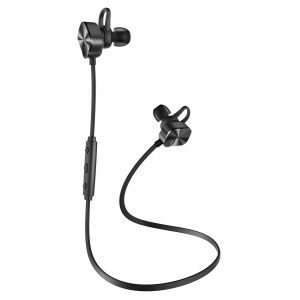 The Sony MDRXB50BS/B is a pair of affordable wireless earphones that are designed so as to meet your exercise requirements without any fuss. 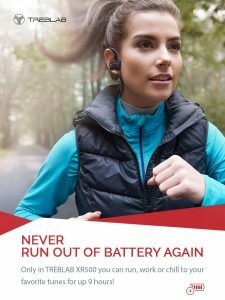 This implies the earphones are sweatproof, lightweight, and flexible. The built-in mic and Bluetooth technology allow you to go completely hands-free. Moreover, the product comes with a battery life rating of 8.5 hours; so you do not need to worry about charging the earphones in the middle of a session. 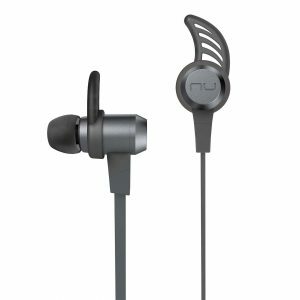 The NuForce BE6i wireless headphones are a lightweight pair that are easy to carry and convenient for running since you barely even feel them inside your ears. You no longer have to be anxious about your earphones getting wet in the rain, for these babies are can withstand both weather and water. Regardless of how much you sweat during exercises or running, this product will not be damaged by that. The in-line remote control has the ability to engage Siri or Google Voice. With dual connectivity and a 98 feet Bluetooth range, these headphones are suited to deliver even in extreme circumstances. They are available in two colors on Amazon – gold and grey. Skullcandy is a trusted name in the headphone industry, and when it comes to their Smokin’ Buds 2 wireless model, they deliver as promised. The sound quality is decent, as is the Bluetooth functionality. The on-board mic/remote makes it easier for you to control volume, change tracks, and pair your Bluetooth device while ensuring a great hands-free experience. The product comes with a removable flex collar, a USB charging cable, and two extra pair of silicone ear gels. 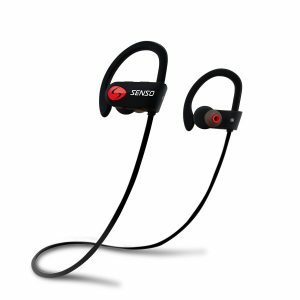 The Senso Wireless Bluetooth headphones are currently the best-sellers in the Bluetooth headsets category on Amazon. And it’s evident why. The HD sound quality, IPX7 waterproof rating, 8 hour-long battery life, Bluetooth 4.1 connectivity, built-in microphone with packed features, and stylish design with secure fit are features that are worth the hype. The passive noise cancellation is as good as it gets for a under $40 headset. 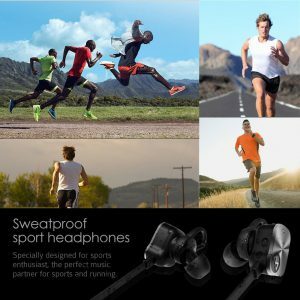 There is a one year manufacturer’s guarantee in place for these sports earphones, so you need not worry about these not being value for money. Deciding on the best earbuds for yourself can be quite a task. The prices can vary over a wide range, as do the features of each. 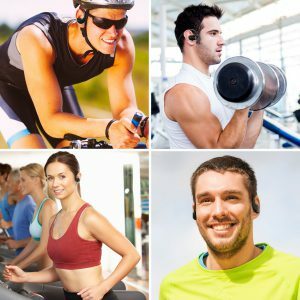 Just like choosing a fitness tracker or running shoes, understanding your personal requirements and placing several criteria for these earbuds is the key to finding the one. 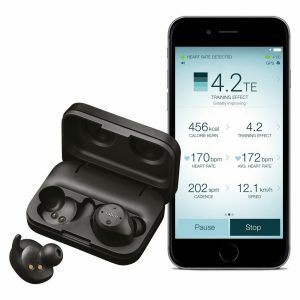 The above list was prepared with the sole purpose of making it comprehensive enough to serve as the ultimate buying guide for the best wireless earbuds for 2017.